Portsmouth City Hall is located at 1 Junkins Avenue, Portsmouth, NH 03801; phone: 603-431-2000. Photo: Moffatt-Ladd House, ca. 1763, 154 Market Street, Portsmouth, NH. Listed on the National Register and designated a National Historic Landmark in 1968. Photographed by User:Ken Gallager (own work), 2009, [cc0-by-1.0 (creativecommons.org/publicdomain/zero/1.0/deed.en], via Wikimedia Commons, accessed February, 2014. The Isle of Shoals, 10 miles from Portsmouth Harbor, saw the first white men in New Hampshire when Spanish and Italian fishermen came in the 16th century. Among these early voyagers was Captain John Smith, who discovered the Piscataqua River in 1614, and on his return to England published a description of the country from Cape Cod in Massachusetts to the Penobscot River in Maine. The first known pioneer was Martin Pring who in 1604 sailed the ships "Speedwell" and "Discoverer" up the Piscataqua River. He came here in search of sassafras in the forests that lined the river banks, but there is no record of his finding any, although much of it was later discovered around the Great Bay. Pring made no permanent settlement in this region. In 1621 Captain John Mason procured a grant from the Plymouth Council of all the land from the river of Naumkeag, now, Salem, Massachusetts, around Cape Ann to the Merrimack, a district that was given the name Mariana. The next year he shared with Sir Ferdinanco Gorges a grant of all the lands between the rivers Merrimack and Sagadahock, extending back to the great lakes and rivers of Canada, a region known as Laconia. Under authority of the grant, Gorges and Mason, in conjunction with several English merchants, attempted to establish a colony and fishery at the Piscataqua River, and made their first landing in 1623 at Odione's Point, 2 miles east of the present city. In the spring of the following year, David Thompson, a Scotsman, Edward and William Hilton, fishmongers of London, with a number of other people, came in two divisions to Portsmouth under authority of Gorges and Mason. One of these companies landed on the southern shore of the Piscataqua, at its mouth, and named it Little Harbor. They erected salt works and built a mansion house, later called Mason Hall. In 1629 scattered planters in the Massachusetts Bay Colony purchased lands from the Indians gathered at Squamscott Falls, obtaining deeds from Passaconaway, Sagamore of Penacook, Runaawitt of Pawtucket, Wehanownowit of Squamscott and Rowls of Newichanwanock, who welcomed them with the hope of being strengthened against their enemies, the Tarrateens. Granted as a township in 1631 with the name Piscataqua, it was later renamed Strawberry Bank, and in 1653 was incorporated as a town by the General Court of Massachusetts under the name of Portsmouth. During the next two centuries many divisions of the Piscataqua territory were made among different towns of the region, and in 1849, Portsmouth was incorporated as a city with its present boundaries. 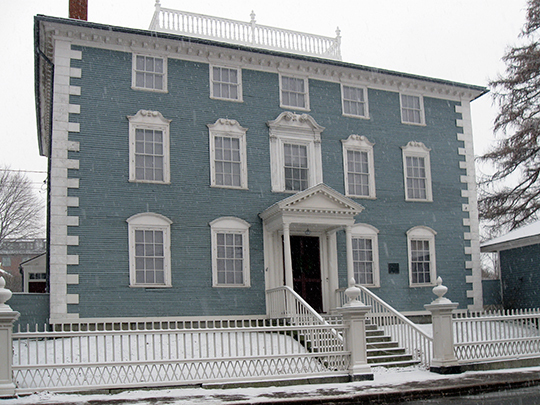 Prior to the American Revolution, Portsmouth was the seat of the Provincial Government, the Wentworth family alone producing three Royal Governors. The town saw many bitter clashes between Patriots and Tories during those troubled years. The early settlers gained their livelihood by fishing and farming. Fine timber around the bay, coupled with the excellent harbor of the Piscataqua, made shipbuilding inevitable, and encouraged the growth of the merchant class, under who Portsmouth prospered. During the 18th century and until after the Civil War, Portsmouth flourished. The early merchants built ships of 200 to 300 tons, which were sent to the West Indies laden with lumber, oil and livestock. Other vessels cleared directly for England, with cargoes of lumber and spars. Private shipbuilding reached its greatest height during the first half of the 19th century, when many of the famous clipper ships were launched from Piscataqua Bay. Works Progress Administration, Federal Writers Project, New Hampshire: A Guide to the Granite State, American Guide Series, Houghton Mifflin Company, Boston, 1938.